Understand their reasons for leaving. 75% of visitors add something to their shopping cart but then leave your site. Use abandonment surveys to find out the reasons why. SMS, email, or ask on-site at the point of abandonment why visitors did not complete their purchase. Visitors can select from pre-defined reasons in one click, or provide more information online. 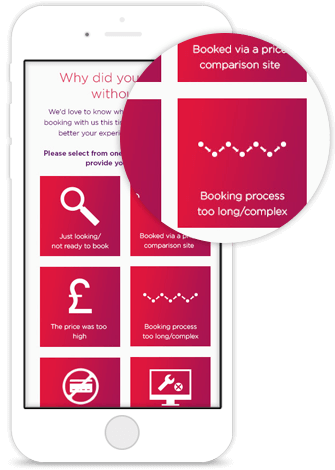 We collate the data and send you the insights to help you make changes and increase sales. Here's the stuff that makes our abandonment surveys fly. 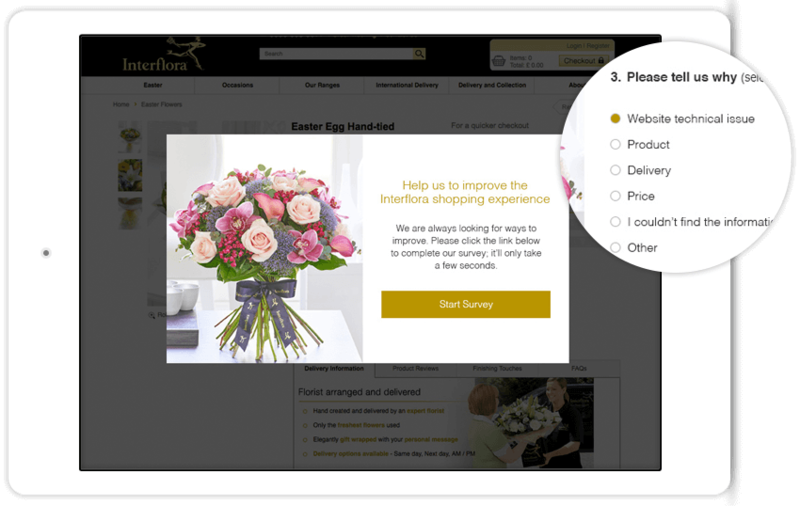 One-Click Email Surveys	Reconnect after an abandonment. Multi-Stage On-Site Surveys	At the point of abandonment. Results & Benchmarking	See how you compare. 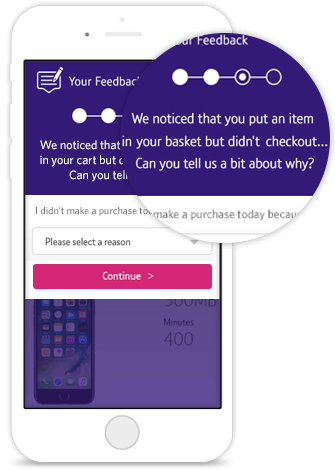 This ideal addition to your multi-cycle cart abandonment email campaign can help you understand why your visitors are abandoning with just one click. Instant insight with one-click submit. Perfect for a third cycle cart abandonment email. Simple multi-choice answers to maximise responses. Ask for feedback at the point a visitor wants to leave and you’ll still have time to change their mind. Display on recognised exit intent. Multi-choice answers for quick responses. Provide real-time solutions based on your visitor’s response. See where you are performing well, or where your site could do that little bit better. We'll collect and collate the data for you. Benchmark results against other websites. See how you compare to others in your industry. Inspirational email designs from some of the world’s biggest brands. 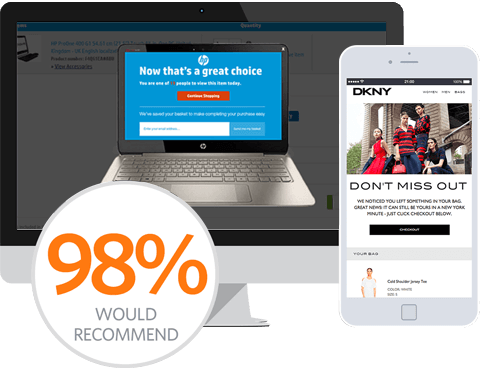 Effectively use remarketing to reduce abandonment, and recover sales. 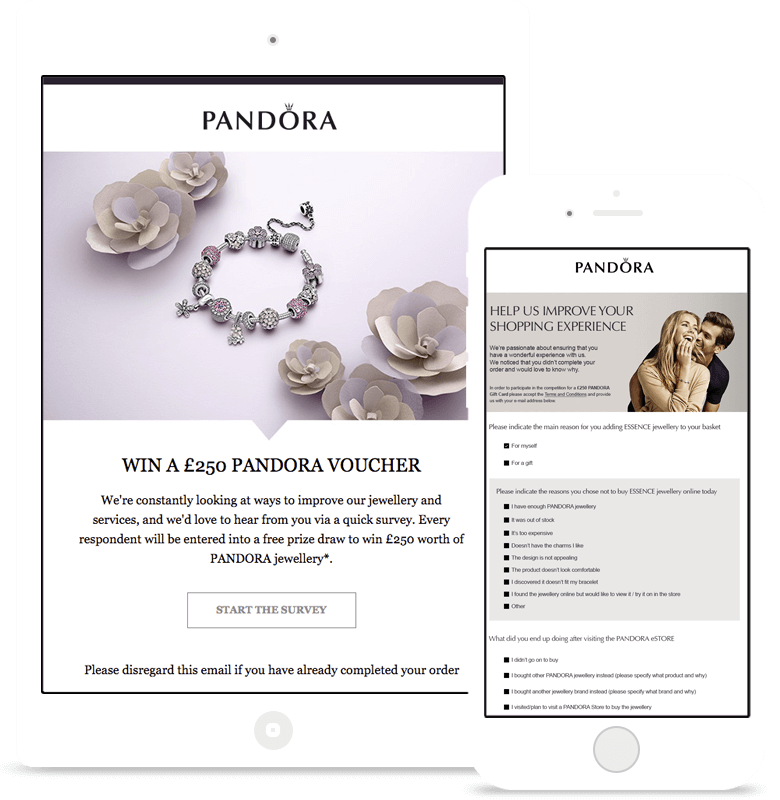 How Can Ecommerce Brands Improve Mobile Conversion Rates? How surveys can help retailers to understand the reasons for abandonment. The Answer to Customer Feedback? 7 top tips to creating your very own abandonment survey. 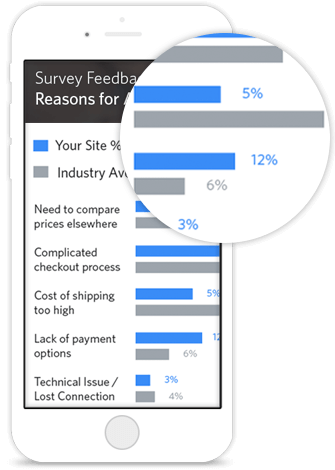 How insights from customer feedback can improve conversion rates. 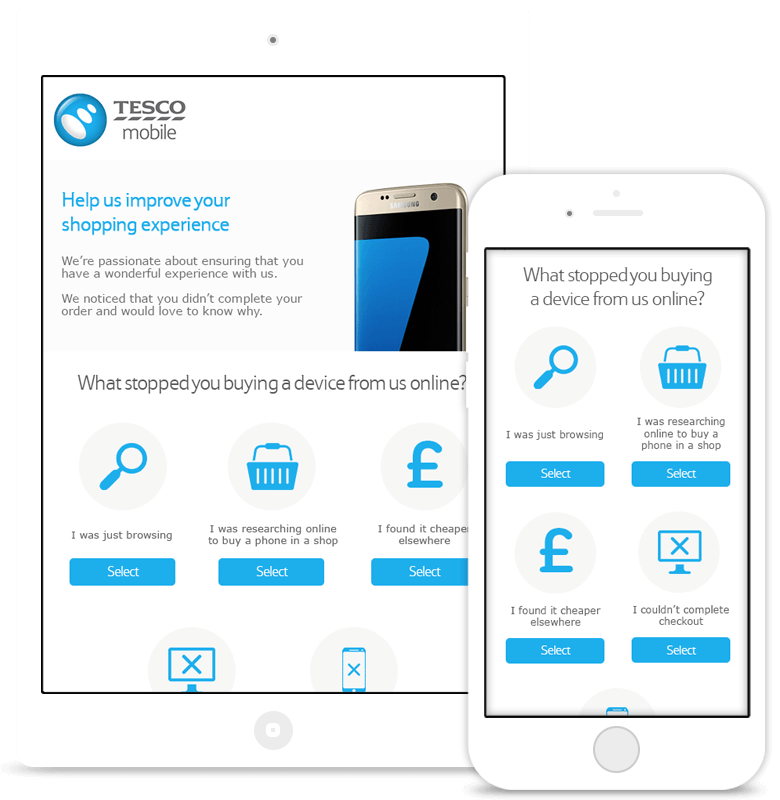 See how Tesco mobile used abandonment surveys to gather data about where they could improve their technology. 01 Who chooses the survey options? It’s up to you! The options will depend on the type of information you’re looking to get from your visitors. We can help with ideas if you’re stuck, based on what other companies are doing. 02 How many questions can we have? Ask as many questions as you need, but we’ve found that simplicity is key. 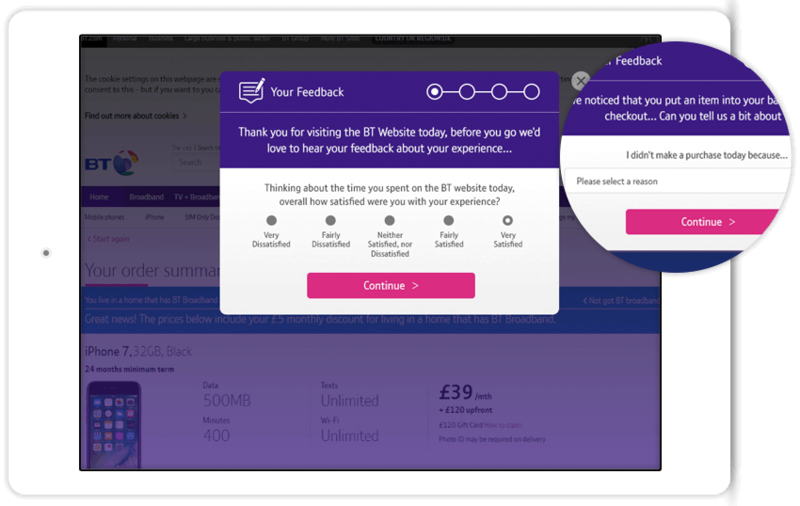 A multi-choice question asking simply for the reason for abandonment, with a one-click submit ensures you get the specific type of data you’re after. 03 How do we see the survey results? Responses will be sent directly to your SaleCycle account manager. They will then compile them, evaluate and feedback the results to you. They’ll also be able to provide benchmarks of where you sit within your industry. Abandonment Surveys have really helped us to drill in and understand where we need to improve the on-site experience.